Rip-rap is the placement of large rocks or coarse stone along the water’s edge of a bank or shoreline to accomplish erosion control. 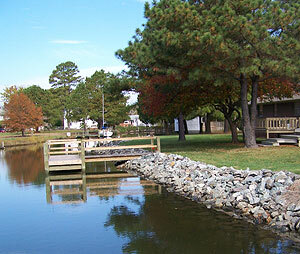 Rip-rap blends into the landscape and has a lower installed cost than wood or steel-pile seawall construction. The price of rip-rap placement depends on access to the project site and distance to the nearest rock source. It also depends on how much other work, such as clearing or earthwork, is required. 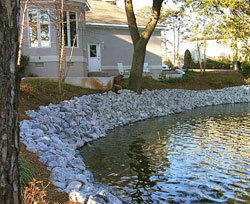 Properly-chosen rock can be an environmentally-friendly landscape design element with lakefront rip rap. 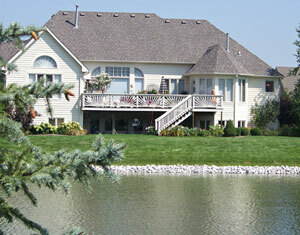 The landscape texture of the rock used for rip rap adds a natural look, yet a defined edge, to your waterfront. Insects and animals can use it for habitat, although rip-rap is not a barrier to organisms moving into or out of the water. Ornamental vegetation material planted in the rip-rap can hide it, providing a naturalized look along with the erosion control. Although not as stable or long lasting as Steel Shorewalls, rip rap can help stabilize a shoreline from wave action and erosion due to run off. Rip rap can make an attractive shoreline, integrating existing trees and plants.